Nikon lens naming convention can sometimes be rather confusing, because Nikon uses letters and abbreviations to identify different lens components. Knowing what each of those stands for can be valuable, especially during the process of evaluating and purchasing lenses. Since Nikon has been producing lenses for so many years and the technology has significantly changed overtime, some of the older abbreviations are no longer used on modern lenses and those are marked appropriately below. AF-S – Auto Focus with Silent Wave Motor. The AF-S lenses have built-in motors inside the lens, which work great on all cameras without built-in motor such as Nikon D40/D40x, D60, D3x00 and D5x00 series. AF-P – Auto Focus with Stepping Motor. These are the newest generation built-in motors that are fast and ultra-quiet, making them ideal for both photography and videography needs. AF-P motors require the latest generation Nikon DSLRs such as D7500 and D500. They won’t work with older DX and FX DSLRs like Nikon D7000 and D800. DC – Defocus Control lenses allow controlling the bokeh, which is great for portraits. FL – Newly introduced in 2013. Indicates that the lens has Fluorite Lens elements, which are optically superior and significantly lighter glass elements. A number of new lenses such as the Nikon 800mm f/5.6E VR now feature fluorite elements. G – If you see a letter “G” after aperture in the lens, for example “Nikon 50mm AF-S f/1.4G”, it means that the lens does not have an aperture ring like the old lenses. All modern Nikon lenses are “G”, because the aperture ring is only needed for old manual focus camera bodies. HRI – Stands for High Refractive Index lens, designed to reduce field curvature and spherical aberrations. HRI lens elements are only present on the best of Nikon lenses, such as the Nikon 70-200mm f/2.8E FL ED VR. E – The new “E” type lenses feature electronic diaphragm control, similar to what we have previously seen on PC-E lenses (below). These lenses do not have the aperture lever on the back of the lens and are fully electronic, so there is no way to manually adjust the aperture anymore. “E” type lenses are more accurate than “G” type lenses, especially for shooting at high frame rates, because the lens can stop down to a desired aperture without the need to be engaged from the camera motor. IF – Internal Focusing allows the lens to quickly focus by moving some of the elements inside the lens barrel, without moving the front barrel or extending in size. Many of the modern Nikon lenses such as Nikon 18-200mm f/3.5-5.6G VR II and Nikon 70-200mm f/2.8G VR II are IF lenses. Lenses with IF acquire focus faster than lenses without IF. RF – Rear Focusing. The focusing is done by moving the rear element inside of the lens, which means the rear element moves while focusing. 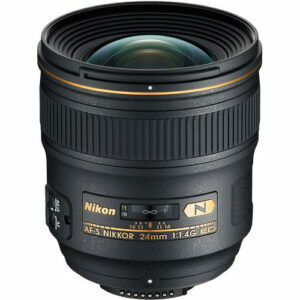 The latest Nikon 24mm f/1.4 lens, for example, is RF. FX – this abbreviation indicates “full-frame”, as in 35mm film equivalent. Abbreviations like FX, DX and CX indicate format size (size of the digital sensor). You will never see FX on descriptions of lenses, because unless indicated otherwise, all lenses are full-frame by default (see DX and CX below). CX – Nikon has a mirrorless system called “Nikon 1”, with a sensor smaller than DX. Although the CX abbreviation is not included in the lens title, you might see it in descriptions and other marketing material. If a lens title starts with “1 NIKKOR”, it means that the lens is specifically designed for CX camera bodies such as Nikon 1 V1/V2/J1/J2. CX lenses do not work on any other Nikon mounts. As you can see from the lens image, it says “AF-S Nikkor 24mm 1:1.4G ED” on the lens, which basically means that it is a fixed Nikon (Nikkor and Nikon are the same thing) 24mm lens with a maximum aperture of 1.4, has built-in auto focus with silent wave motor (AF-S), has no aperture ring (G) and contains extra-low dispersion glass (ED). The large letter “N” on the side indicates that the lens has Nano Crystal Coat. The rest of the information is not displayed on the lens, but can be obtained from the lens page in our lens database. Mahmud – Obviously a bit late to mention this as you have probably gone ahead and bought a Nikon. However, there have been no change to the way Canon lenses operate since 1987 when they introduced their EOS (Electrical Optical System) cameras and their EF (Electric Focus) lenses. It introduced complete electrical operation of their lenses from their cameras – from auto focus motors in the lenses (something Nikon is just getting round to doing), electrical operation of the diaphragm for aperture control (another thing Nikon have only just got round to) a new larger lens mount that will accommodate all future maximum apertures (a Canon EF 50mm f1 ‘L’ series lens is already available) and as a result a Canon EF lens I bought in 1987 will work in every sense on my recently purchased Canon EOS 5D MK IV. Not only that but the Canon ‘L’ series of lenses are rated the best in the world. Chances are that Nasim won’t allow this comment on his blog though. Can you tell what camera bodies these lenses would be compatible with? Say I have a Nikon D5100. Since the Nikon D5100 is a DX (crop sensor) camera body, any NIKKOR DX and FX lens can be attached. However, because there is no built-in camera focusing motor, only a lens designated AF-S (auto focus silent wave motor) will perform auto focus. AF lenses (without the silent wave motor) can still be used in manual focus mode. I AMY NOT BE CORRECT FIRST OF ALL PLZ APOLOGIZE ME FOR A SUGGESTION THAT RF IS TO BE MENTIONED. I AM A LEARNER AND THIS ARTICLE HELPED ME FIND THE BEST KNOWLEDGE I EXPERIENCED TILL DATE! HATS OFF AND A GOLDEN SALUTE TO YOUR KEEN EFFORTS SIR! I have been looking at buying a zoom lens and I am quite confused by focal length and the zoom factors, my problem is that I have a nikkor 18-55mm vr and the advertised zoom factor on that is 3x, I have been looking at one of your recommended lenses which is the 55-200mm vr and that one states it has a zoom factor of only 3.6x. Can you explain how you convert focal length into a factor of zoom? And which lens I should buy if I want a serious zoom lens? I am sure I am getting it wrong here but if 55mm is 3x then surely 200mm should be 10-12x! I look forward to your reply Nasim and thanks for your help in advance. Zoom factor relates to the amount of zoom range a lens has, not the magnification it produces. This is calculated by dividing the maximum focal length by the minimum focal length. For instance, 55/18=3, so an 18-55mm lens has a zoom factor of 3x. 200/55=3.6, so a 55-200mm lens has a zoom factor of 3.6x. Please I will like to know the major difference btweeen Nikon lens 10-24mm and 55-200mm. Hope to hear from you guys soonest. 10-24mm and 55-200mm refers to the focal length of the lens. 10mm is an extremely wide angle and 200mm is telephoto (a lot of zoom). Both Nikon lenses are designed for DX (crop sensor) camera bodies and have a built in auto focus motor (AF-S). I hope this answers your question. Point 15 refers to “FX” but “FX” is not explained in the list. “FX” is explained right after VR in the list. “FX” refers to the size of the digital sensor, and means it’s a “full frame,” or approximately 24mm x 36mm in dimensions. I have a keen interest in Photography since long. But, I am neither a pro nor armature. But Govt. duty demands to take photo shots in every place. I want to buy one DSLR within a range of $500-600. Which one will be suitable from the brands of Canon, Nikon or any other available brand in Amazon.com. Now AF-P is here, any plan to update this article? I am based in Colorado and always refer your articles for any photography related questions and tips which I always find very helpful. Thank you. Currently, I own Canon crop body and planning to switch to Full frame body Nikon. As I am more familiar with canon right now, I trying to find out if Nikon Lens has anything like Canon L series lens. Is there any indication for Nikon Lens to tell if they are luxury lens. Preetam, you should always is research the specific lens you plan to purchase. However, Nikon has a marketing convention similar to the red ring L lenses: gold ring lenses. Some of the best lenses for your first full frame are the Nikon 50mm f1.8G, Nikon 35mm f2D, Nikon 85mm f1.8G, and Sigma 24-105mm f4 (Nikon mount). Feel free to reply with questions about specific gear. Thanks for your response, I appreciate that! Those three are all fantastic lenses and cover the entire fundamental range of focal lengths (and then some). Since you’re intending to buy a 70-200mm lens, you should consider a Tamron 24-70 f2.8 VC rather than the Sigma 24-105 f4 OS. Both are good choices; you can decide whether the extra range of the Sigma or the extra aperture of the Tamron is more important to you. Dear Sir, I am planning to purchase my first DSLR NIKON within a month. I have tried my best efforts to chose the model. I have narrowed my choice for D5200 and D5300. Here Inam in Great Confusion. Apart from WiFi and GPS, D5300 have some points to think……No Low Pass Filter, Higher ISO Range, slightly Bigger LCD, Exceed 4 Processor. ARE THESE POINTS WORTH EXTRA COST? I am planning to purchase 70-300 LENS at cheapest price. I am keen Enthusiastic Amateur Photographer. At present I am using SONY SGP321 TAB for photography. I think I am considerable good. If I understand correctly, Nikkor AF & AF-S lenses from my D3000 can be used on a D7200. Technically there is no such thing as the “AF-D” lens, they are two different things. What information/specifications can you tell me about my Nikon ED AF NIKKOR 70 – 300mm 1:4-5.6 D zoom lens? I am planning on using it to photograph the Eclipse Aug 21, 2017 with a Nikon AF-I Teleconverter TC-20E teleconverter. Would you consider this combination practical for this purpose? Do you feel it will produce more than acceptable results? like i have D3100, which lense should i use next as i have kit lens 18-55mm. The 55mm-200mm lens would be a good choice. Phase Fresnel (PF) lens elements effectively compensate for chromatic aberration and ghosting when combined with ordinary glass lens elements. The PF lens element is based upon the Phase Fresnel lens, which appears to have a series of concentric circles engraved onto it. Utilizing a Phase Fresnel lens element allows Nikon engineers to use fewer lens elements, resulting in a more compact and lightweight lens. Due to the characteristics of a PF (Phase Fresnel) lens that utilizes the photo diffraction phenomenon, when there is a strong light source within the frame or when light enters the lens from outside of the frame, ring-shaped colored flare may occur according to shooting conditions. This phenomenon can be minimized with “PF Flare Control” to be included in Capture NX-D (ver.1.1.0 or later). For more information, see software Help/manual. Capture NX-D is available from the Nikon website. Be sure to keep your software up to date. Another “pro” tip – if the lens has the golden ring on the top (just like the one shown here as an example), the lens is considered by Nikon to be premium equipment. Thank you for the information. Saved a lot of time in researching what lens will be best and I build my gear. In the picture example of the lens, is this particular lens a FX mount or DX mount. Great website. I’ve bookmarked it for future research. Hi, I’m new to photography. I recently bought a Nikon D5200 with kit lens Nikon DX VR18-55mm and 55-200mm AF-S GII. I soon realized that the apperture is not large enough to produce my desired effect. Someone wants to sell me a Sigma 50mm 1.4 EX DG HSM Nikon mount and I don’t know if this lens is compatible with my Nikon D5200. The lens is expensive so I’ll like to ensure I’m not making a mistake in buying it. I’d be grateful for some guidance. Do I understand correctly, that an AF lens will not Autofocus on a Nikon D5100?